You can open online help for Veeam Agent for Microsoft Windows. You can visit Veeam Community Forums and share your opinion or ask a question. 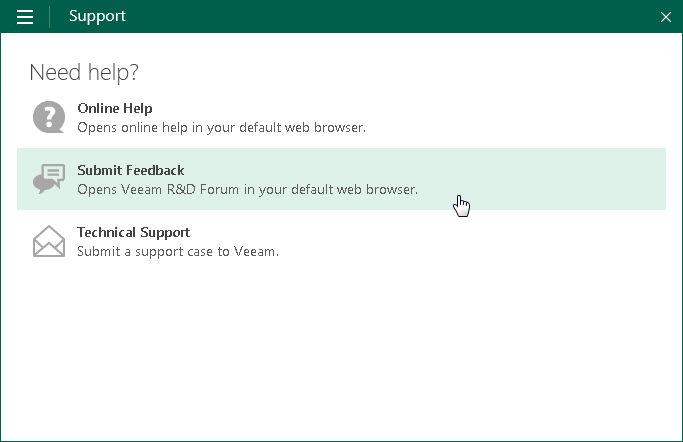 You can submit a support case to the Veeam Customer Support directly from the product. To learn more, see Reporting Issues. Right-click the Veeam Agent for Microsoft Windows icon in the system tray and select Control Panel. Click one of available options to get support on the product.